I am an unabashed lover of market mechanics in board games. Let me be clear, the emphasis in that last sentence is Market Mechanic. Why the emphasis, well as Michael R. Keller of Visible Hand Games and I discussed at UNPUB 4, many people mistake market themes with market mechanics. A few people avoid all market mechanics because they mistakenly associate them with bad market theme games that do not use any market mechanics. That is why I am starting a new lecture series examining different types of market mechanics and how to use them in board games. But before I discuss specific market mechanics that can be used in board games, I need to clarify what is the difference between a market theme and a market mechanic. Themes are stories. Stories can be spun so that a particular action represents something occurring within the story. When I play Formula D my friends and I are telling a story about driving a race car. Am I actually driving a race car, no, but I am taking a series of actions that lets me pretend I am driving a race car. The grafting of a story to a set of actions is a theme. A mechanic is undertaking a particular set of actions to achieve something. For example, in Monopoly I can roll a dice and move my pawn. The mechanic is roll and move. I am physically rolling dice and moving it along a board. Because I use a roll and move mechanic does not mean I call it that within the game. Theme lets me pretend the act of rolling and moving is achieving an imaginary outcome, be it go to work and collect my salary in Monopoly or advance my car in an auto race in Formula D.
Mechanics and themes do not have to be different things. We can play the game 100 yard dash by physically running the 100 yard dash and seeing who can finish the race first. The theme and mechanics is the 100 yard dash in the 100 yard dash game. Should Mechanics and Themes Always Be the Same? Each mechanic needs to be assessed on how it will contribute to the enjoyment of the game. Some mechanics are a great theme by themselves. Charades is a game built on a mechanic of acting. Acting is fun, acting is silly, acting makes a great game. Others mechanics are events you never want to experience in real life. For example, I personally do not want to play a game of Werewolf were the sheriff eliminates a players by physically shooting and killing them. To assess if a market mechanic contributes to game play we need to understand how different market mechanics work and how to separate the market mechanic from a market themed game. This lecture on market mechanics will not only empower us to answer the question when market themed games work better with market mechanics, but also when do market mechanics contribute to non market themed games. If you have not picked up your tickets for the upcoming UNPUB Mini at the Game Parlor in Chantilly, VA (in northern Virginia just west of D.C.) on June 21st, do not worry, you do not need no stinkin tickets to attend. The event is free, so just show up and you will be rewarded with the latest board games from over 10 designers (including Dr. Wictz) ready for play testing. To give you a taste of the upcoming excitement, I invited designer Michael Karg to talk about the games he will be demoing at the UNPUB Mini. I first met Michael at the 2013 Congress of Gamers UNPUB Protozone where I playtested his game Boondoggle. Michael Karg: You broke the game then, but I have fixed it and am looking forward to letting you try to break it again. Dr. Wictz: Can you give people a quick run down on Boondoggle. Michael Karg: Boondoggle is a road construction game set in a corrupt city. Resources are bought and sold on a volatile market, players can become honchos of a particular resource and there is a great deal of shenanigans going on. Dr. Wictz: And is Boondoggle the only game you are bringing? Michael Karg: I’m also bringing Aesop’s Gambit, a card game with poker elements and characters of fables facing off in various predicaments. Dr. Wictz: How has Boondoggle changed since you started presenting it at UNPUB events? Michael Karg: I have edited and streamlined it since last year. Hoarding of the limited resources was a problem and rather than completely eliminate that possibility, I added a twist that sharpens the strategy and makes the final round much more competitive. Plus, I added Bus Lanes, which offers another route option and also eliminated a paralysis-by-analysis bugaboo. Dr. Wictz: What inspired the theme for your games? Michael Karg: The word “boondoggle” was the starting point. It’s a funny word and a pervasive problem –think Silver Spring Metro Transit Center for Maryland folks. A boondoggle is a project that takes on a life of its own with a bloated budget, no end in sight and no easy way to end it. The Concorde jet was another one –billions spent on an impractical project before it finally killed. Wonkish folks should also look up the “sunk cost fallacy”. As for Aesop’s Gambit, after playing Pacific Typhoon, a WWII card game, I wanted to play around with that central mechanic of card play in a completely different arena. Besides Aesop, I threw in some Beatrix Potter and Wind in the Willows. Savagery and brute force may win, but sometimes the humble and clever slay the dragon. Dr. Wictz: What are you hoping to learn about your games at the UNPUB Mini? Michael Karg: I want to constantly refine them so that game length goes unnoticed because everyone is fully engaged at all times and loving it. That’s a real challenge to pull off with unambiguous rules and mechanisms, but it’s fine to try. Dr. Wictz: What piece of advice would you give first time designers attending their first UNPUB Mini? Michael Karg: Listen and observe. Take in as much as you can about what playtesters are saying and doing during your games, and do the same when you’re playing other prototypes. I love to learn how other designers think and see their own games, and how they evolve. Dr. Wictz: How did you get into designing board games? Michael Karg: I love to take things apart, which is the only way to learn how to create something. I love Agricola and in asking myself why I like it so much, I began to see how the theme and mechanics working together so beautifully. It’s a habitable world with difficult choices and a sense of humor, and it is endlessly playable. Reverse engineering like this can be as much fun as playing the game itself. Dr. Wictz: So you really enjoy making board games? Michael Karg: I enjoy the freedom of creating little worlds. I get to make up the characters, the rules and the story with the challenge of making it all familiar. The homemade, arts-and-crafts aspect is a big part of the process for me. Using wood and markers and glue reinforces the tactile nature of board games. The solid, physical aspects of board games are often not as appreciated as much as they should, but subconsciously, I think they make a big difference. I enjoy the raw, visceral nature of my games as well as seeing that handprint in other designers’ prototypes. Dr. Wictz Any shout outs to your most dedicated game testers (cough cough, wife, gf, etc.)? Michael Karg: I have to thank all of the dozens of people who have played my games so far, but especially, my wife, Chris, who is always brutally honest in her critique. Dr. Wictz: Thank you Michael for taking the time to talk with me. If you want to learn more about Michael and his games you visit his website http://www.michaelkarg.com/ or follow him on twiiter @michaelkarg. We are only a few days away from an UNPUBmini at the Game Parlor in Chantilly, VA (in northern Virginia just west of D.C.) on June 21st. The event is free and has over 10 designers (including Dr. Wictz) bringing their latest board game designs for play testing. To give you a reason (as if you needed any more) to stop by for an afternoon of board gaming heaven I invited board and video game designer Matthew O’Malley of Black Oak Games to stop by and give us a preview of what he is bringing to the UNPUBmini. Dr. Wictz: So what are you bringing to the Chantilly UNPUBmini? Matthew O’Malley: I'll be showing Knot Dice. I created custom dice that attach side-to-side to form Celtic knot designs for use in puzzles, art creation, and in several different games. Right now I'm testing a cooperative game, a partnership game, a full competitive game, and a real-time game. Dr. Wictz: How as Knot Dice changed since you started presenting it at UNPUB events? 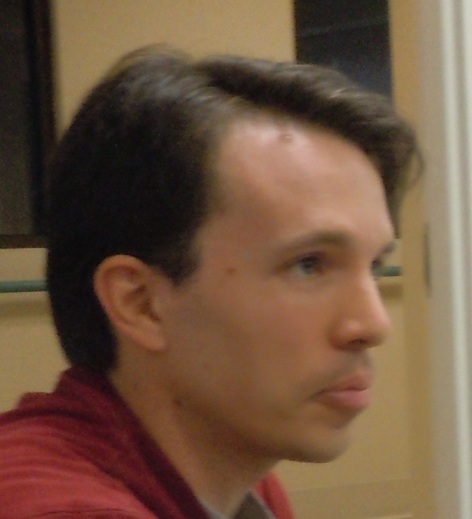 Matthew O’Malley: I first presented my Knot Dice at UNPUB 3 in 2013. Since then, I've designed several new games to play with the dice, and have improved the games' rules. I've done away with some of the more complicated game ideas, and developed others that require just as much strategic thought but are far simpler to explain and play. I'm excited about a new game that can be played with my Knot Dice which was inspired by Ben Rosset, another game designer I met through UNPUB. Knot Partners (working name) has each player working on two tableaus, one with the player to the left and one with the player to the right. The setup creates some interesting decision points. Dr. Wictz: Why do you have so many different game variations you can play with Knot Dice? Matthew O’Malley: The different variations of the game grew out of the original development of games for the dice. Since it started as more of a puzzle-game, I was always thinking about different ways I could use the dice, and I came up with a lot of game ideas. My hope is that once the dice are out in the wild, other designers will come up with new games to play with them as well. -Kells is a cooperative game that has the whole table working together. -Square Knot is an individual competitive puzzle-game. -Knot Partners is a game in which you are sometimes partnered with one player and sometimes partnered with another, which adds a bit of a social element. -Knot So Fast is a high-speed dice-rolling individual game. Dr. Wictz: What inspired the theme for Knot Dice? Matthew O’Malley: The Celtic knot theme was originally inspired by a friend of mine, Campbell Maloney [http://alphabetgallery.com/], a graphic designer who created an alphabet formed by shapes cut out of circles and then rotated. I spent a lot of time tossing ideas back and forth with him, and came up with the idea of making some puzzle games using Celtic knot designs. The Celtic knot tradition has always fascinated me -- I love the look of the illuminated manuscripts from centuries ago as well as modern interpretations of it. It doesn't hurt that I've got a fair bit of Irish ancestry, and play Irish fiddle (along with other types of music). Dr. Wictz: Does that mean I can talk you into bringing your fiddle to the UNPUB mini? Dr. Wictz: Looking at Knot Dice it sort of reminds me of your game video game Celtic Knots. Matthew O’Malley: After I developed the Celtic Knots mobile game, I was driven to find a physical manifestation of the idea. Originally, I was focused on the puzzle aspect, and thinking about flat wooden puzzles with the knot pieces, possibly double-sided to get more patterns out of a set. But I couldn't get enough designs out of them, so I moved on to cubes, which became dice, which took me to far more interactive games (rather than individual puzzle-solving like in Celtic Knots). Dr. Wictz: I notice on twitter you were exploring trying to make your game out of different materials, like cardboard squares, why did you decide to stick with the dice? Matthew O’Malley: As far as dice versus cardboard cutouts, I've just gotten to the dice first. I do have plans in the works for Knot Cards and Knot Tiles, with game ideas emphasizing the strengths of each of those components, but the dice were my original idea and they appeal to me so much that I want to carry that idea through to production before spending too much time on the others. Matthew O’Malley: I had a job with a relatively long commute, and after trying to occupy my time with various other activities or creative endeavors, I discovered that I could use that time thinking up and developing board game ideas. So I spent several years coming up with games that were far too complicated and took far too long to play, didn't have enough interesting decisions, or just weren't that fun. It wasn't until I started attending UNPUB events that my designs evolved enough for me to consider publishing them. Dr. Wictz: Why do you love making board games? Matthew O’Malley: I love making board games for so many reasons. I love bringing so many different elements together to craft an experience for a group. It's like directing a play or a movie, but the end result sometimes is a much more interactive experience, and can create some great stories about time spent together with friends. Dr. Wictz: What games have you published thus far? Matthew O’Malley: I have two tabletop games being published in the near future, Diner (by Dice Hate Me Games), which has already been successfully Kickstarted and will be released this summer, and Battle of Wits (by Game Salute) which will be released as part of The Princess Bride set of games. Dr. Wictz: Is it harder to get a video game published or a board game? Matthew O’Malley: My experience with getting a video game published was relatively painless, though I did have to hire a developer for a good deal of the programming work. Once I found a reliable developer, the process moved pretty smoothly, and the process of actually releasing the game on the mobile stores wasn't too difficult. The part of the process that I did not consider enough was support for the game, particularly on the Android platform. The iOS game is still basically the same as when I released it (besides some minor bug fixes), but the Android game required constant development work to keep up with new devices and OS changes, and I couldn't afford to keep it on the market. As far as whether it's harder to get a video game or a board game published, I think it depends greatly on your skills and your method of publishing. If you are a developer, it would be pretty simple to publish a mobile game. If you can acquire some nice art assets, it can be relatively easy to self-publish on a print-on-demand site like Drive Thru Cards or The Game Crafter. Or, going the traditional publishing route, if you can find a publisher who is really interested in licensing your game, you can pass it over to them. But of course, you have to put in a huge amount of time first getting the game ready for publishing. And once it's ready, you have to spend a huge amount of time on the actual publishing process. Dr. Wictz: What is your favorite memory from past UNPUB minis? Matthew O’Malley: I have to say when a store clerk told me that Star Dice (a game I was showing at the time) would be perfect to take out and play with kids at their school outreach activities. I think anything that appeals to kids has that "fun" factor that's so hard to nail down. Dr. Wictz What are the positives to attending an UNPUB mini versus a larger board game convention? Matthew O’Malley: I get much more of a chance to talk with the players at a smaller event, and to play other designers' games - and the players I think also get more of a chance to talk with the designers and find out about the game design and playtesting process. Dr. Wictz: Any shout outs to your most dedicated game testers (cough cough, wife, gf, etc.)? Matthew O’Malley: My most dedicated game testers are my wife and my kids, and they help immensely with getting the ideas ready to show to other people - and they don't just say that they like everything I show them. I also have a great group of friends which was originally a game night group that I rope into testing my games as often as possible. Dr. Wictz: Thank you Matthew for stopping by. If you want to learn more about Matthew’s games you can follow him on twitter @BlackOakGames, facebook, or go to his website www.blackoakgames.com. Or, if you are in the area, you can stop by the UNPUB Mini at the Game Parlor in Chantilly Virginia on June 21st and meet him in person. I honestly discovered Father Geek by coming across board games that proudly highlighted that they were “Father Geek Approved.” This made me ask, who is Father Geek? Is he a wise old man like father time, or, as I later discovered, a young father name Cyrus Kirby undertaking the most challenging RPG of all time...fatherhood. Dr. Wictz: Thank you for stopping by for a chat in the faculty lounge. Can you give a quick run down about what is Father Geek in case folks are not familiar with your blog? Cyrus Kirby: Father Geek is a website dedicated to any and all individuals who teach life lessons through geekiness and play. "Better parenting through games and geekiness" is our slogan and our motto. We play games with children and adults, non-gamers and uber geeks. Each game gets hours of table time and a thorough review. The end result is a game review that provides comments from a very wide range of ages and players. Dr. Wictz: Why did you start Father Geek? Cyrus Kirby: I started Father Geek as a way to support my wife's project. She wanted to start her own blog and I didn't know much about the software or process. Since I'm her "tech support", I created a blog of my own to test new plugins and get to know how the code was working under the covers. Since I was going to spend some time on the website, I decided to write about something I enjoyed: playing games with my kids. Four years later, Father Geek is still going strong. Dr. Wictz: How did you recruit your former co-bloggers? Cyrus Kirby: When I first started Father Geek, I invited my fellow gaming parents to contribute. I created a simple template for them to follow and then let them decide when they wanted to publish a review. With the software I use to run the backend of Father Geek, contributors could type their review and upload images directly to the site. When they were ready for it to be published, they just had to push a button. Dr. Wictz: Father Geek has gone through some transitions from being a multi-person outfit to just being you, what were the positives and negatives of that transition? Cyrus Kirby: Doing anything by yourself is less interesting than doing things with friends. The same can be said for Father Geek. Originally, it was a group project and it was great to have so many friends working on it. However, one of the goals of Father Geek was to simply report how games were played and enjoyed by multiple groups. I wanted the reviews to be as objective as possible, highlight the positives, and be a supportive ambassador of our hobby. Some members of the original group didn't care for this idea, finding reviews to be more worthwhile if they were subjective in nature, focused on negatives, and suggested a game was good or bad. Overtime, every co-writer has left Father Geek either due to lack of time, wanting to pursue their own projects, or in disagreement with the Father Geek vision. More than anything, Father Geek has been a learning experience for everyone involved. It has had its ups and downs, but friendships were never in jeopardy. I have learned a great deal from every person who has contributed to Father Geek and feel immensely fortunate to have worked with them. Father Geek is now run only by me, but it is still a group project. I play games with kids and adults. I might be the only one writing, but I get to play with lots of people who contribute to the project by simply joining me at the gaming table. Dr. Wictz: Has the type of games you review/play changed as your children aged? Cyrus Kirby: The types of games I play and review is not based on the age of my children. Father Geek plays games with adults, too. If I receive a game that is too complex for children, I focus on the adults. Likewise, if I receive a game that is intended for children, I tend to focus less on the adults. There has never been a game I couldn't play with someone. What has changed are the many games I get to play with my children. When a new game arrives, the very first thing I do is put it in front of my 3 children to look through. We look at the rules, go over the game bits, and talk about what the game is about. This greatly interests them and they want to learn how to play the game. As a result, all 3 of my children play board, card, and dice games that are much more complex than other games traditionally targeting their age group. As they continue to grow, they become increasingly better at games, logical thinking, and critical analysis. Dr. Wictz: Has your perspective on board gaming changed after you had children? Cyrus Kirby: I have a lot more patience for games and people nowadays. Teaching a complex game to a 6-year-old takes time, patience, and willpower. I have found that there is no such thing as a "bad" or "good" game. For every player there is a game, and for every game there is a player. Perhaps the greatest shift in my perspective is that I no longer see board game as just a distraction. I now see the subtle lessons they teach, the skills they strengthen, and the positive rewards of social interaction they provide. Dr. Wictz: What mistakes about introducing board games to your kids did you learn from your oldest child that you did not repeat with your younger children? Cyrus Kirby: Never be afraid to introduce board games to your children, even if they are much more complex than you think they can handle. I made the mistake of "assuming" some games were too difficult and denied my son and myself the pleasure of playing the game together. I have now introduced very complex games to all 3 of my children. If the game is too complicated, I simply dumb it down by removing rules until it gets to a point where I can play the game with them. Of course, this doesn't allow me to review the game for that age level, but it does allow me play the game with my kids. If there is one thing I suggest every parent do is simply try. If the game works, great. If not, change it until it does. The goal is to play with your children, not learn how to play a game. Dr. Wictz: Do you plan on having any of your kids write/contribute to a review as they grow older? Cyrus Kirby: Without a doubt. My two oldest have already told me they want to write for the website. But in a very profound a real way, they have been contributing to Father Geek from the very start. I write about them. Without my children, I wouldn't have any reason to have the website. My children are the source of my inspiration and the only reason why Father Geek exists. Dr. Wictz: How did you come up with Father Geek as the name for your blog? Cyrus Kirby: When I was thinking about what I wanted to write about, I thought I'd focus on the two subjects that I was very passionate about: my kids and geek culture. The first name that came to mind was "Father Geek" and it just so happened that the domain name was available. I never thought of a second or third possible name because the first captured everything I wanted the site to be about so perfectly. Dr. Wictz: Will it you become Grandfather Geek when your children are grown up and starting their own families? Cyrus Kirby: Since I have the privilege of being a "father" for the rest of my life, the site's name will never change, but the young people who I get to play games with most certainly will. I get to play with my kids and their friends today. In the future, I look forward to playing with my children and their children. Dr. Wictz: How did you come up with the idea for the Father Geek Seal of Approval? Cyrus Kirby: The Father Geek Seal of Approval came about because a game publisher wanted something from me that suggested that the game was endorsed by us. My initial gut reaction was to politely decline. I didn't want Father Geek to be anything other than be an ambassador of or hobby. I wasn't comfortable with the idea that someone would make a choice on a game based on my opinion. Besides, there are plenty of other reviewers available today who make strong opinionated arguments for or against a game. I honestly didn't see the need. But then I thought of a going about it differently. What if I were to only provide a "seal of approval" for a game that was enjoyed by all three of groups? This would mean a game was enjoyed by children, adults, non-gamers, and gamers alike. Now that is a game worth talking about! And so, the "Father Geek Seal of Approval" was born. I only offer it to those games where Child, Parent, and Gamer Geeks all voted to approve it. It is important to note that I NEVER have a say about the game getting the seal or not. It is not up to me. Dr. Wictz: What was your reaction the first time you saw the seal on a game box? Cyrus Kirby: The first time I saw the Father Geek Seal of Approval on a game box I felt exceedingly happy and then overly nervous. The thing is, I don't want to be recognized. I'm just this guy, you know? But that fear quickly subsided and I am hopeful that others see the Father Geek Seal of Approval as a sure sign that a game will be enjoyed. If I sat down next to you at a gaming table, you'd think I was just this nice guy who likes to play games. And you know what? You'd be right. Dr. Wictz: If you were to introduce someone to your blog and you could only have them read one entry, which entry would you have them read? Cyrus Kirby: This is a very difficult question to answer. Impossible, even. Father Geek is organic in nature. I write from the heart and that means each article is unique. I constantly rotate out different players, which means comments and observations are always different, too. There is almost 4 years of content and over 500 game reviews. But if you need a place to start, I would start with my "Games by Type". Read the game descriptions and then dig a bit deeper into whatever interests you. Dr. Wictz: I saw last November you became a victim of your own success and you had to stop accepting game submissions, have you caught up on the backlog and are accepting board game submissions again? Cyrus Kirby: No I have not yet caught up, but I have stopped the crazy train, so to speak. I am eager to play any and all games. A bit too eager. Titles published from big publishers, small independent publishers, and print-n-play games all interest me. I don't want to turn anyone away. As a result, the games I was provided to review piled up and up and up. It became a source of stress instead of a source of enjoyment. I knew I had to turn this around or I would risk being burned out. So, I simply stopped accepting new games and am now focusing on the ones I have. Once I have reduced the total number of games down to a reasonable amount, I'll warmly invite anyone to send me what they have. Dr. Wictz: I know your wife also writes a blog, do you help each other with your blog writing? Cyrus Kirby: My wife helps me by playing games and providing input to my writing. I help her out by writing articles for her and providing technical support when needed. It works and allows us to contribute and support each other in a way that is both natural and intuitive. We have very different audiences and approaches with our content. For example, my wife thinks I am nuts when my average review is 3000+ words long and it takes me 2 weeks to review a single game. I, on the other hand, don't see why anyone would care to type the pros and cons of a specific brand of hand soap in less than 200 words. Dr. Wictz: Is there a board game designer you always wanted to interview? Cyrus Kirby: While Father Geek doesn't publish interviews, I would love a chance to sit down and talk to P. D. Magnus, the creator of the Decktet game system. He created a series of cards with symbols that have been used to create over a hundred different games. Games, I must add, that are very good. I would love to find out how the Decktet game system came about, how he designed a game system to be flexible enough to allow for unlimited freedom of creativity, but rigid enough to always provide structure. I think the system and the design is simply brilliant. Diving into the mind of the individual who created such a thing would be a wonderful experience. I encourage your readers to take a look at the Decktet. If you'd like to know our thoughts on the game, give our review a read. Dr. Wictz: What is your favorite type of board game? Cyrus Kirby: My favorite kind of board game is the kind where you get to explore and the game evolves around you and your decisions. My very first game of this type was Dungeon! by TSR. I would later play HeroQuest Milton Bradley and much later play games like Betrayal at House on the Hill and Runebound. These are all games in which you get to have an adventure and its never the same adventure. Dr. Wictz: Thank you again Cyrus for taking time to stop by the faculty lounge. If someone wanted to learn more about the father geek blog where should they go? Dr. Wictz: You can also follow father geek on twitter @thefathergeek and on facebook.